you used a small tripod trellis for yours; did you it or buy it? Hi there! The thing it is hanging from this a wrought iron “tripod-like” frame. It is meant to go into pots and allow vines to climb up it, like an obelisk or a tomato cage/frame. It was simply three legs with a fleur-de-lis topper holding them together. I bought it at a local garden center. Hope this helps! You gave me a use for all my tiny flower pots! Thanks! It would be helpful to take a picture farther back, showing top to bottom in the garden. Love this idea! This looks easy and very eye catching. 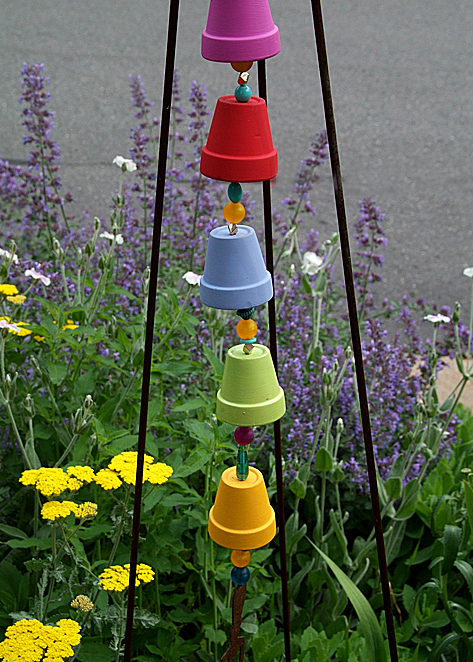 Can you please tell me the wire for the trellis of the clay pot wind chime ,what type of wire is it and where can I find it? I have been to craft and hardware stories and nobody can tell me! What do you have yours hanging from in the picture and where can it be found or how can it be made? I am so excited to try this! Can you tell me the size of the pots? Hi Sara, not sure if I responded via email to you or not. In case I didn’t, I wanted to tell you that I use the terra-cotta pots that are about 2-2.5″ in diameter. You could use slightly smaller or larger, depending on the size of your beads you’re going to string through them. Thank you responding to me today. So far, I have made fifteen of these and they are gorgeous! (Yes, fifteen!) I figured out the size pretty quickly and I was off and running!